Global warming has raised sea level about eight inches since 1880, and the rate of rise is accelerating. Scientists expect 20 to 80 more inches this century, a lot depending upon how much more heat-trapping pollution humanity puts into the sky. This study makes mid-range projections of 1 to 8 inches by 2030, and 4 to 19 inches by 2050, depending upon location across the contiguous 48 states. Rising seas dramatically increase the odds of damaging floods from storm surges. 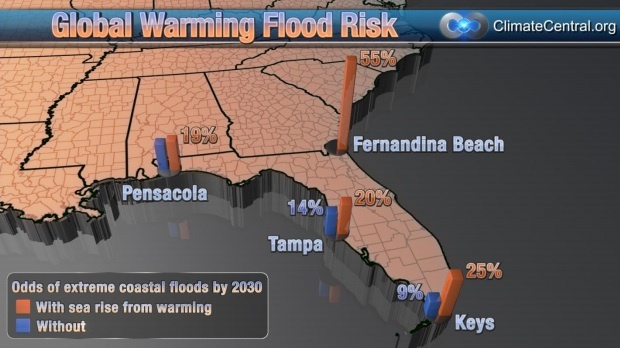 For more than two-thirds of the locations analyzed (and for 85% of sites outside the Gulf of Mexico), past and future global warming more than doubles the estimated odds of “century” or worse floods occurring within the next 18 years — meaning floods so high they would historically be expected just once per century. For more than half the locations analyzed, warming at least triples the odds of century-plus floods over the same period. And for two-thirds of the locations, sea level rise from warming has already more than doubled the odds of such a flood even this year. As the report notes, five million people live less than four feet above current high tide levels. Climate Central found that three million acres of key infrastructure like roads, bridges, schools, farms, and hospitals are also at risk from flooding as sea levels rise. Miami-Dade and Broward Counties each have more people living on land below 4 feet than any US state except Florida itself and Louisiana.